Voter Registration Day is part of the larger initiative “March for our Lives,” which has called on mayors from across the country to participate in get out the vote campaigns and empower their communities to have their youth’s voices be heard during elections. New Rochelle Mayor Noam Bramson also took the time to stop by CNR to meet some of the newly registered students. “High school and college students have the power to make a real difference in our community and nation, and have a profound stake in the choices made by government. 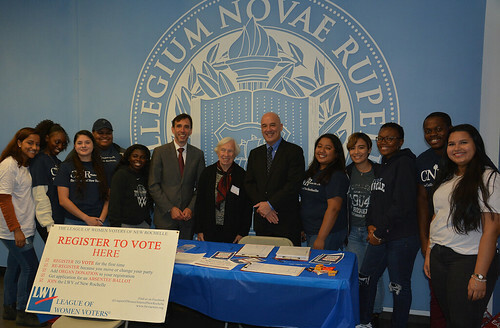 So whether Democrat, Republican, or Independent, whether liberal, moderate, or conservative, we encourage every eligible young person in New Rochelle to register, to vote, and to make their voice heard,” said Mayor Bramson. Several students expressed how much they looked forward to voting for the first time, including Kailee Frank, who, though a junior, had not yet registered to vote. “It’s liberating to be able to vote and to have a say in who leads the country,” said Jessica Ramirez, a freshman from the Bronx.